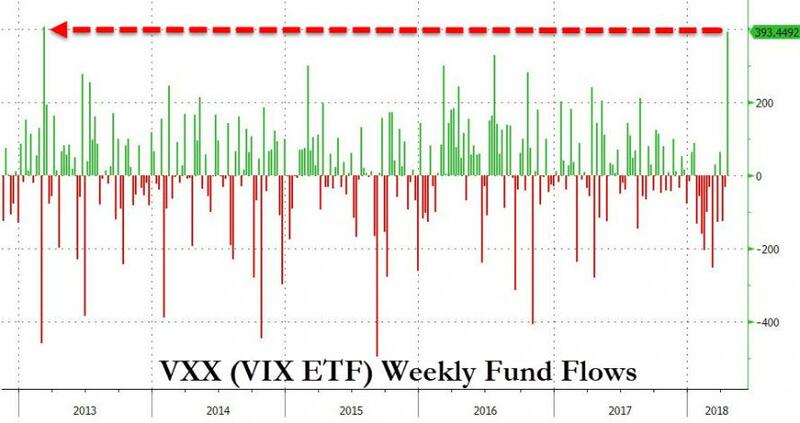 VIX ETF Has Biggest Inflows In 5 Years As Goldman Sees "End Of Low Vol Regime"
Investors placed more bets on rising volatility last week than in any week since March 2013 (ahead of the market's 'taper tantrum'). As Bloomberg reports, the iPath S&P 500 VIX Short-Term Futures ETN had more than $393 million in inflows last week, as the number of outstanding shares for the note rebounded from a low. Additionally, two leveraged securities that benefit from increasing stock turbulence also saw inflows, while an ETF that rises with market calm posted outflows. And, just like Dollar shorts and Treasury shorts, there is yet another extremely crowded trade. 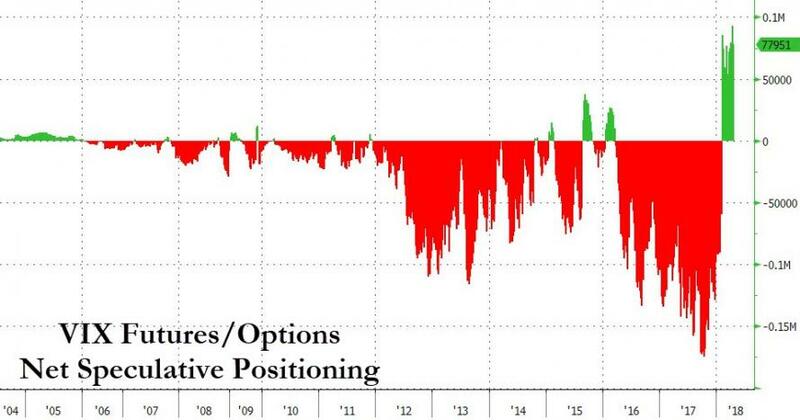 And Goldman Sachs suggests this positioning may be right as they believe the recent vol spike has snapped markets out of the "low vol regime" that dominated 2017. The S&P 500 has moved through 15 low and 14 high vol regimes in the past 100 years. While we ﬁnd the macro backdrop tends to condition vol regimes, regime shifts have often been difﬁcult to pin on macro alone. Especially since the Great Moderation, vol has often disconnected and led macro, in part due to the unwind of ﬁnancial imbalances. We ﬁnd the predictive power of current volatility for the future, the vol clustering effect, has become less strong as vol of vol has picked up since the 1990s. Also, longer periods of low volatility increase risk of higher volatility in the medium term as they can result in ﬁnancial and market imbalances. We identify macro and market drivers for S&P 500 volatility to assess the probability of shifts between regimes. We ﬁnd that the probability of a continued low vol regime has declined but a sustained high vol regime still appears unlikely. That said, anticipating vol regime shifts has been difficult and vol often leads the indicators we identified. Low vol regimes can be more easily forecast, as these might be more related to the macro, whereas high vol regimes may, at least initially, be less linked to fundamentals. High vol regimes regularly come with extremes in the indicators. The probability of being in a low vol regime is often highest when indicators are favorable – but not at extremes, as that could signal a turning point. Low vol regimes tend to be ‘risk on’ and carry-friendly, which usually means rising valuations across assets. The opposite is true in high vol regimes, somewhat unsurprisingly. S&P 500 risk-adjusted returns tend to be highest during low vol regimes and the same was true in 2017 , when the S&P 500 had a 12m return / volatility ratio of 4.2x. Similarly for multi-asset portfolios, changing vol regimes are important as equity/bond correlations have been more positive; in addition, high S&P 500 volatility often coincides with high volatility across assets. As volatility increases, so does the probability of larger moves, in both directions. This also means that ‘buying the dip’ tends to be a less good strategy at those times, as drawdowns can last longer and be deeper. That said, large vol spikes can increase the medium-term asymmetry of equity returns. With rising volatility, somewhat counter-intuitively, option selling strategies have performed better: we ﬁnd that call overwriting and put writing is more attractive outside low vol regimes.